We offer the Resident Council financial assistance in funding projects they would not normally be able to undertake, award leadership scholarships to outstanding students, and help the undergraduates with our time and talent in whatever way we can. We send the young men to national leadership events such as Phi Kappa Tau National Convention and Leadership Academy, where they make valuable contacts and learn lessons that that will serve them well after graduation. We not only focus on students, but graduate Brothers as well. We help maintain communications among alumni and furnish opportunities for fellowship and further brotherhood. We co-publish Now and Ever, a newsletter for all brothers, and publish a directory of Phi Chapter. In addition, all members of Harvard Red and Old Gold in good standing are honored with their names enshrined on a commemorative plaque on prominent display at the Phi Chapter house on the Bethany campus. We accomplish this through pledges of $1000 per brother towards the permanent Harvard Red and Old Gold endowment, which is used to purchase revenue-producing, high-grade investments. Income from the endowment will be used to aid Phi Chapter, at the discretion of the HROG membership. All officers serve without pay, and administrative costs are minimal. This way, all HROG income supports the chapter directly. A thousand dollars may seem like a lot, but we have several plans to help you help your Chapter. Pay in yearly installments of $100 or $50 (or more if you can), or bequeath $1,000 to the Fund in your will. 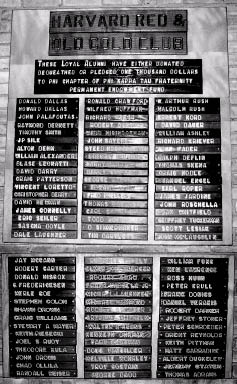 Every way helps Phi Chapter grow stronger. Also, many employers offer matching donations for their employees’ favorite charities. As a non-profit, public educational foundation, HROG is eligible for such programs. Thus, you can help Phi doubly as a member of HROG. If you have already fulfilled your pledge but want to continue to support the ongoing efforts of HROG, you may do so by making a gift to the Leadership Fund. Gifts to the Leadership fund may be made in any amount, and go toward the same Chapter-strengthening activities. These gifts are also tax deductible. You may make as many gifts to the Leadership Fund as you like.